User "Idea" is working in collaboration with this development with regards to ship models. V4.0 onwards now includes Drones for sale on factories in various sectors in the X-Universe as ready to use technology. As a result this development requires the use of the EMP mod. EMP - a drone with a tactical pulse weapon to effect ship systems. Jamming drones - Limited missile ECM defence capability. Mine Layer - a drone to deploy mines in an array in sector. Hacking - a drone to hack hostile Station relations. Collection - A more intelligent flying ware collection drone, with regard to home ship cargo restrictions and definable priorities. That works together with other drones. Economic - similar to advert drone but does some investigative work to stock levels on factories with a report for a sector before deployment. Mining drones - Mines asteroids extracting minerals. Repair drones - Repair ships and stations by an amount using Teladianium as a resource. This script process requires the EMP mod. Please ensure that you have installed and verfied this installation beforehand. Extract into X3TC games directory. You will require Cycrows Plugin Manager for the spk file. Balance considerations are always being taken into account for having alternative methods in the form of drones but I may not always get it right so feel free to suggest. If you want to suggest new drones ideas please feel free to do so but please try to keep them sensible as I'm trying to keep the expendable nature of them intact, and I'd be interested in your feeback of their use. "You are not allowed to use any of these scripts and/or models without my express permission for distribution". Last edited by pelador on Sat, 8. Aug 09, 22:38, edited 138 times in total. 04.03.2009 V3.2 Revision of more realistic SOWP resource requirements. 06.03.2009 V3.3 Hacking Drones Implementation, improvements to Interface. 21.03.2009 V3.8 Several feedback improvements and Sub menu use. 30.03.2009 V4.1 Shadow, Privateer, Economic and Collection drones implemented. Misc. improvements and tweaks. 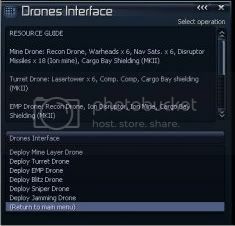 01.04.2009 V4.2 Bug fix correction to collection drones when collecting mines. 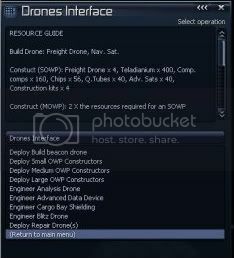 03.04.2009 V4.3 MOWP and LOWP options with constructor drones, and mine toggle command to mark for collection inclusion/exclusion. 19.04.2009 V4.5 Geology and Mining Drones implemented. New features, feedback, corrections. 03.05.2009 V4.7 Implementation of Espionage Drone and Station Construction at PHQ. Last edited by pelador on Sun, 3. May 09, 03:52, edited 19 times in total. Now includes Analysis Drones and All drones Cycrow spk download, for which you will need Cycrows plugin manager. All drones spk updated in main first post. Last edited by pelador on Tue, 3. Mar 09, 06:09, edited 1 time in total. Advert earnings adjusted. See its thread. All drones Cycrow plugin updated. MKII Spy and Tactical Drones AI improved to avoid race control logic problems. See individual links or download all as main spk above. Using inverse square law calculations this drone will allow you to effect ships systems in an area. More details to follow hopefully soon. EMP Drones implemented. All drones spk file updated to include them. Analysis Drones slightly rebalanced to include "bothersome" reactions, details can be found in the linked thread. All drones spk file updated to reflect this. Currently working on upgrading the Advert Drone so that the navigation beacons they deploy will be able to download some specific software options remotely from nearby sector stations and install them to ships for payment as normal. As I previously mentioned due to this development "growing" I need to curtail my use of the community resources in terms of commands and text files used. As a result in the near future, after the above, I will have to combine the drones into one development and make their use menu driven from hopefully one command. I'll try to introduce hotkey registrations with no defaults so users can assign them as needs to balance this as a result, have to see how they operate as the next stage of learning. As a result the previous individual choices will be replaced by a combined package. I'll make a point of documenting any features to remove when I do this to ensure current users have a "tidy" setup. For those who have used Cycrow's plugin manager and the spk files this will be straight forward, not that the other process wont be, just a bit less user freindly to switch over. Advert Drones updated so the resulting beacons can download and install a limited selection of software remotely. Details in linked thread. All drones spk file updated. V3 is now a consolidated package replacing the individual scripts and so freeing up community resources. The drones and their features (e.g. beacons) can now all be found in a menu interface under special commands (software required) of the command console. I have also added one hotkey registration to this menu from access from the players ship. For players who have used Cycrows plugin manager the conversion is as usual. 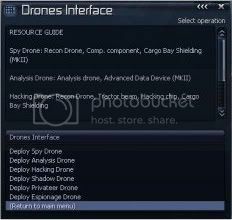 You will have to uninstall the plugins associated with the drones and then add the new all drones package. Then you can install the new package. Currently talking with Moderators as to wether it would be better to merge the various info threads into one thread, to leasson the impact on changes to the forum. The other info threads content could easily be merged with the main thread and the links in the main page adopted to use start locations within it. Hopefully it wouldnt cause too much confusion. Just pointing this out now in case anyone uses notification options. Now consolidated into one package. Now includes regular MKI drones and their more secretive cousins the MK II drone. The ship can launch a drone that will fly to a chosen gate within the SAME sector and then on passing through the gate will fly to the centre of the sector (x:0, z:0) approximately 15km above the sector 0 point through that gate. Once there it will convert itself using the computer components into an advanced satallite after a very brief period. To order a ship that is equipped to do so simply go to the Special Drones menu under special commands in the command console. Its a fairly intuitive process after that. Select gate. Then select wether to deploy a MKI or MKII drone. Carefull use has to be applied with settings as enemies will still attack spy drones or deployed satallites if discovered. MKII Spy drones are a little bit more secretive in getting to their destination. As a result all communications are lost and no details are recieved from its gravidar scanner to prevent possible detection. MKII Spy drones need 1 unit of Cargo bay shielding to be applied to the drone. Last edited by pelador on Sun, 12. Apr 09, 06:59, edited 2 times in total. The ship can launch a drone that will fly to a chosen sector position and then on reaching its destination will convert to 6 mines in a 3d Cross (+) orientation a distance of 1km from the drone. Note: you still have to arm the mines manually. 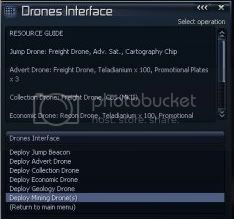 To order a ship that is equipped to do so simply go to the command console of the ship as normal, select special, then you will see a new menu called Special Drones then select "Deploy Mine layer drone.". Its a fairly intuitive process after that. Select sector and position. Then select wether to launch a MKI or MKII Mine layer drone. Then the type of mine you wish to deploy: T = Tracker, S = Squash or I = Ion. Carefull use has to be applied with using mines as they have no freind/foe discrimination once armed. And enemies will still attack drones or mines if discovered. MKII Mine Layer drones are a little bit more secretive in getting to their destination. As a result all communications are lost and no details are recieved from its gravidar scanner to prevent possible detection. MKII drones need 1 unit of Cargo bay shielding to be applied to the drone. Last edited by pelador on Sun, 12. Apr 09, 07:00, edited 3 times in total. "The Teladi have struck a partnership with Boron Drone engineers for their particular use". Now with advertising earnings and bonus for station proximities. The ship can launch a drone that will fly to a chosen sector position and then on reaching its destination will convert to a navigational beacon from the drone. To order a ship that is equipped to do so simply go to the command console of the ship as normal, select special, then you will see a new menu for drones, select this interface and then "Deploy Advert drone.". Its a fairly intuitive process after that. Select sector and position. The advert beacon will gain credits every 5 minutes (game time) up to a limit of 1,000,000cr when the contract will expire. There is a bonus for setting them up in core sectors however then the contract has a limit of 5,000,000cr. New contracts are only issued to new beacons. The total earnings will be displayed on the beacon. In V1.3 the earnings have been changed, not increased by any factor on a comparable basis but they will earn different amounts around the previous figures. Between 750 cr and 1250cr. Limits are unchanged. 1) Placing them within 10km of a factory (NPC or Own) will earn a potential bonus if the price of the product is below average, i.e. buyers are wanted. 2) NPC factories give a better bonus. 3) Core sectors still have a better base rate. 4) There is some randomness to it. Note: as the values are small I'm interpreting the money to come from corporation sponsorships and other information aswell as focusing sales to the cheapest wares so funds come from a universal slush fund so to speak. Let me know if player fabs should give a bonus as I have made them and wether they should pay for the bonus? (But as there is no rewards as yet, other than the cash generation it would only be a balancing act with player accounting so not worth doing. Easier just to make the bonus 0 for own fabs if one shouldnt be paid). Enemies will attack Advert drones and beacons which dont have any gravidar sensor range but they do allow best buy/best sell information to be relayed. In V2.0 there is now a trade command on the console (Relay Navigation Beacon) in the console to communicate with the beacon (or any navigation beacon you own) if the ship is within 25km. The ship will require the Trading System Extension for this. The resulting communications will allow the ship to download specific software from equipment docks and headquarters as applicable if within 10 sectors and install it. You will of course still have to pay for the upgrade. As a bonus it ignores relational issues in the availability of these software items as you are plugging into a subspace datastream through the gates that the beacons can decode. The suppliers being more concerned about sales. Last edited by pelador on Sun, 12. Apr 09, 07:00, edited 2 times in total. Now with the improved MKII version. The ship can launch a drone (on menu in special commands interface menu) at a ship in the same sector as the launching ship that will follow that "target" scanning it to then analyse and make schematic blueprints to be transfered to your HQ. However, if it loses scanning lock periodicaly it will cause anomolies in the scanning result causing potential errors, this usually happens when the distance goes beyond it's scanning range. On losing contact it will attempt to re-establish contact with the target ship and continue scans. Once a successful scan of a ship is completed the drone will attempt to fly back to the player HQ and transfer the schematic. Only certain classes of ship can be scanned (M7, M6, M8, TM, TS, TP, M3, M4 and M5) and alien technology such as Xenon, Khaak and some others is not compatible for the scanning process. The target ship also has to have a current maximum speed below 200m/s as any speeds greater than this cause anomolies in the scan. Also hull intergrity has to be above 87% in order to get a reliable scan. Cargo bay shielding on target ships will interfere with scan times. Messages will be relayed for any aborted scan commands due to restrictions. (Note: Plot ships cannot be scanned). A SINGLE scanning time is normally 6.4s for small fighters, double for M8, M3, TM, TS, TP, triple for M6 and quadruple for M7. This is associated with the size of the vessel and therefore the quantity to scan. But it takes multiple scans to complete an analysis. There are ways to reduce overall scanning periods on Analysis drones but I will let you discover those secrets yourself. As blueprints are involved you obviously require a Headquarters to return them to, the drone will abort the launch without one. You can only fit one Analysis drone per ship as it is technically considered an updgrade extension due to its complexity. As much as freindly ships may only be a moderate challenge to these drones, dont expect the drones to last long in enemy territory. MKII details: the launch process requires a selection between MKI and MKII drones. MKII drones have to be equipped with an Advanced Data Device for the extra processing power and data storage. They operate in no different way from their MKI counterparts except that with the MKII you can target M1, M2 and TL class vessels. Scan times and amounts are more for these larger ships. See how to get your hands on an "Advanced Data Device" below. So how can I get an Analysis Drone I hear you say? "You have to engineer them"
On a ship with the above requirements you can order (Special Drones Interface in special commands) part of the crew and any marines on board to begin canabalising the above wares to retro-fit an Analysis Drone. The larger the ship the more crew can get involved, in order of involvement from crew, with highest first: (TL, M1, M2, M7, TM then others). And the more marines the better. The engineering skill of marines has a direct correlation to how effective their contribution is. During the build cycle you will notice the ships shield will suddenly deplete. Don't worry this is only the constructors using energy from the shield generators to supply work equipment, and the impact will reduce over time. They recharge still during these periodic energy transfers but the amount the shields reduce to can be a useful indicator as to the progress of the engineering. The engineering process can be lengthy dependant on type of ship and number of marines (and their skill) on board. Note, if you remove marines during build process this will impact the rate at which the engineering progresses. Also docking at stations will reduce engineering production as the shields cannot recharge without drawing energy from the station which isn't viewed favourably. The engineering process also produces "waste" as a result of all the left over parts from the canabalisation process which will be deposited into the ships cargo hold. The process is exactly the same as engineering an analysis drone. However less time is involved to engineer Advanced Data Devices. However you will notice it uses Nividium and crystals, these are combined with regular technology to create a crystal matrix capable of capturing data into a 3 dimensional holographic array that exist in a subspace time compressed state thus allow the device to slip time by a small amount and therefore record data in time aswell as physical dimensions. As a result this significantly increases the storage capabilty. It also uses the Software Signature Scrambler in this way for the detailed calculations using quantum mechanics which is transfered to the device in the process. Last edited by pelador on Sun, 12. Apr 09, 07:01, edited 5 times in total.